Aker Arctic’s annual customer seminar where Arctic specialists and other professionals from the shipping, shipbuilding and other related industries from around the world have gathered in Helsinki, Finland, since 2006. In addition to presenting the latest projects from Aker Arctic, the event has attract speakers from shipping and shipbuilding companies, the oil and gas industry, classification authorities and other partners. 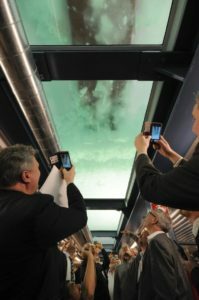 One of the highlights of the event is an ice model test demonstration held in Aker Arctic’s ice tank. This free event is only open to invited guests. The 12th Arctic Passion Seminar was held at Aker Arctic in Helsinki, Finland, on 2 March 2017. Presentations and photographs are available upon request.